Remember the owl drawing I did a few weeks back? Well, my wonderful sister (Amira) made it into an iphone case for me! 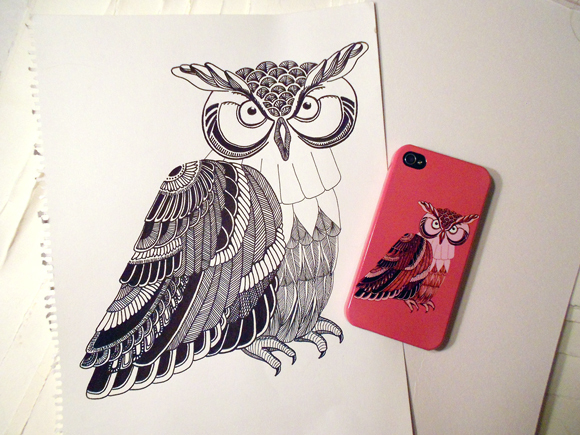 This entry was posted in drawings and tagged art, design, drawing, illustration, iphone case, owl by zanabot. Bookmark the permalink. Wow, that looks great. I’m sure my girls would love something similar (they’re too young for an iphone, though!). They’re into owls these days. Well, i have made a yellow version which I’m sure Samira would love! Maram has her own owl drawing which she likes more. And, Zayla (since she takes after me..) will like the classic black & white or the pink one.